The award-bedecked indie masterpiece Beasts of the Southern Wild is finally available on DVD today. Get it. Do it right now. 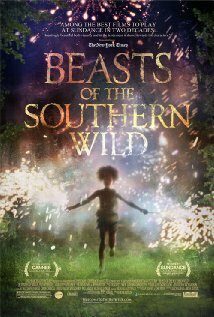 The brilliant tale spins quite a yarn, following 6-year-old Hushpuppy through tumultuous times in an area of the Louisiana Delta called The Bathtub. The wee heroine, played by Quvenzhane Wallis (a force of nature to match the hurricane that’s coming) puzzles through the upsetting events of her father’s failing health and the suddenly ferocious weather with the poetic logic of a child – gloriously nonsensical yet frighteningly reasonable. Wallis joins her director Benh Zeitlin in astonishing debuts, as does the equally fierce and amazing Dwight Henry, playing Hushpuppy’s father Wink. Full of folklore and enchantment, their collaboration amounts to one wonderfully original vision of freedom, self-determination and loss. For another, more chilling, tale of subculture survival, try Winter’s Bone. In her breakout role, Jennifer Lawrence is riveting as Ree, a young Ozark Mountain girl in danger of crossing the wrong people as she searches for her father and uncovers some dark family secrets. John Hawkes leads a stupendous supporting cast and, along with the unflinching writing and gritty direction of Debra Granik, joins Lawerence to make Winter’s Bone a must. ← So That Happened…Meet the Chirpers!